Tuf Turf - Three different fine bladed turf-type perennial ryegrasses for sunny areas. 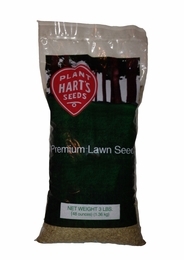 Best for over-seeding ball fields or high traffic areas. Varieties are all improved cultivars that blend together for that green carpet look. Minimal fertilizer required but should be over-seeded every 2-3 years. Perennial Ryegrass (100%). Open ground seeding rate: 7 pounds per 1,000 square feet. One half rate for over seeding. Expect initial germination in 5-7 days.